LumApps has kept expanding around the world but we are stabilizing our exponential growth from last year to ensure lasting results. We now count over 120 people in our LumApps team worldwide. LumApps opened a new office in Sydney, Australia, in addition to our other offices in New York, Austin, San Francisco, London, Tokyo, Paris and Lyon. We doubled our number of events this year, covering ever more bases to meet new populations of professionals! Over 2018, LumApps gained traction inside the tech industry and recognition from multiple independent organizations. We will boost our communications next year for even more references to choose from! We made the official LinkedIn list this year on the French LinkedIn, based on objective measures for growth. Sometime this year, LumApps hit over 3 millions users, and counting, on the Google Cloud Marketplace. We thank all of our users for trusting LumApps and making this possible! That’s right, we made the official LinkedIn list this year on the French LinkedIn, according to objective measures for growth. The year started off swell with this news that we’re among the fastest-growing SaaS companies! After Google NEXT, tech site ComputerWorld wrote about our project with customer Finish Line! This year we participated in the best Google events as we did before, yet we also grew our presence in “agnostic” events: professional and tech trade conferences, focusing on the deciders that help LumApps gain traction, from IT, Internal Communication, HR and Digital Transformation. Our first big event was in our home country of France: Google Cloud Summit Paris. Then we headed to Google Next San Francisco with many great stage interventions, announcing and demo’ing Google Cloud Search, and speaking with Finish Line about their success with G Suite and LumApps. 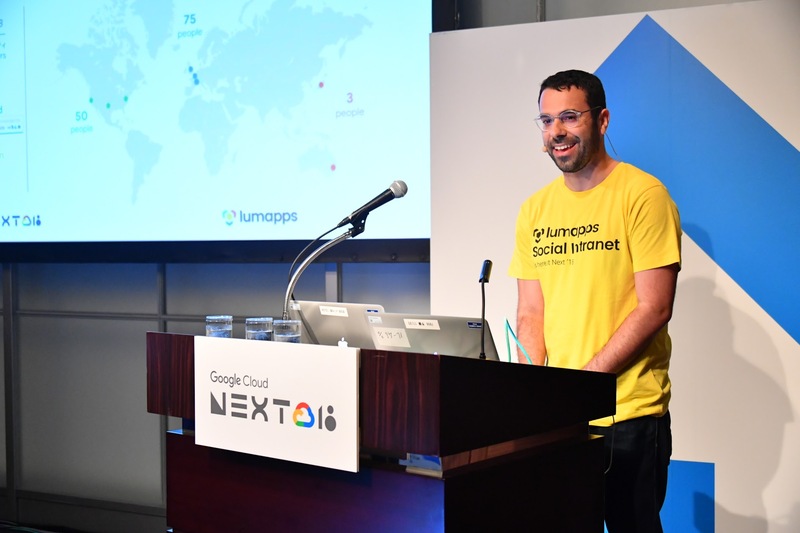 LumApps rocked Google NEXT Tokyo to speak to the Japanese Google market, and reinforcing our global presence. We finished the year on a strong note, attending Google Next London, where our CTO Elie reprised his role talking about GCS. We multiplied what we call “agnostic” events in 2018, general trade events for tech professionals. What’s more, we’ve grown our events team, we plan on doing even more in 2019! 2018 is also the year the LumApps solution became more mature, with new integrations, expansions, and better performances overall to provide the best user experience. Our mobile applications have grown a lot since their beginnings. Now they are an essential part of the LumApps social intranet for many of our customers who need to access information and resources on-the-go. Among the biggest updates, you can now customize the app to your colors, configure notifications, create rich content, participate in communities and leverage powerful search to find information. LumApps added multiple work apps to its roster, including Zapier and ProcessMaker, both bringing task automation to LumApps users. In 2018, LumApps added two key Google integrations to the already seamless integration with G Suite: Google for Education and Google Cloud Search. G Suite customers know by now that we’re the best recommended social intranet for the Google environment! LumApps added multiple work apps to its roster, bringing task automation to LumApps users. Our customers shared their LumApps success stories more than ever, whether during webinars, events or in online PR posts. Take a look at what these key customers achieved with LumApps this year! US healthcare provider CityMD won 2nd place at the Intra.NET Reloaded awards for their intranet project. 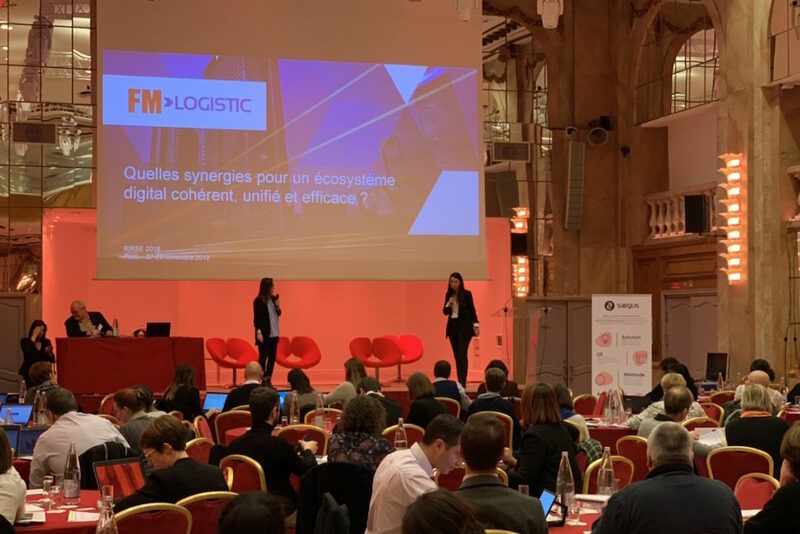 International logistics provider FM Logistic published a video and online PR about their new intranet project with Google and LumApps. They also hosted a panel at Smile Expo London in October. US sports retailer Finish Line spoke about their digital transformation with Google and LumApps at Google NEXT. Watch their session. If you want to measure our progression, you only need look at our post from last year 2017 in Review: Exceeding Expectations.